CURRENT WARNING FALSE WIKIPEDIA and or self proclaimed „Royalty“ BLOGS/Comments CONTENT POSTED BY THIRD PARTY IN VIOLATION of WIKIPEDIA TERMS and GERMAN LAW – Paid false entry? Seine Hoheit Fürst Waldemar zu Schaumburg-Lippe-Nachod. He is the head of the Princely Family zu Schaumburg-Lippe-Nachod, independent and seperated since 1842. The Nachod branch is a princely house in its own right, and false information by third party is invalid. His Highness Prince Waldemar (Seine Hoheit Fürst Waldemar) is the head of the Nachod Branch and princely house. The Nachod Branch is the Royal Branch of the two Schaumburg-Lippe branches who are not in good terms with each other since generations. 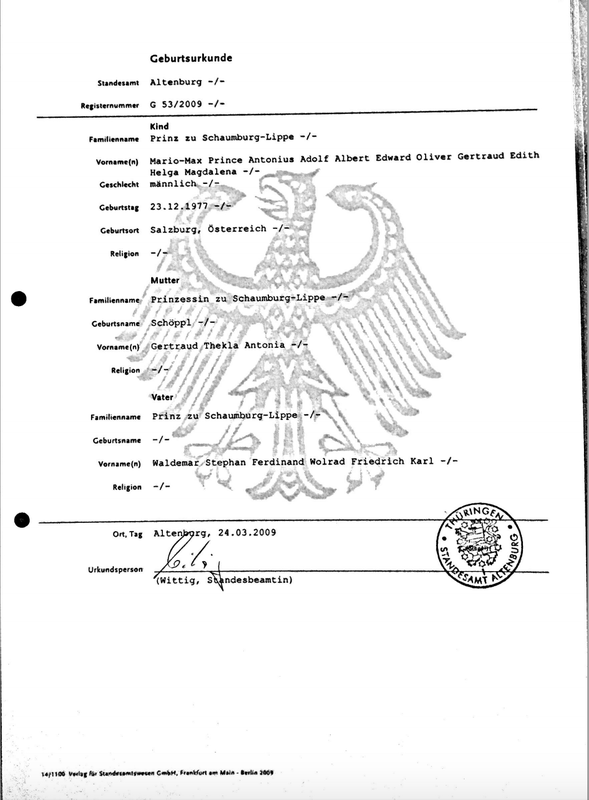 The claims and or comments of other individuals named „Prinz zu Schaumburg-Lippe“ or „Prinzessin zu Schaumburg-Lippe“ are individual opinions and are of neither officially valid or of any official character, as are the postings of such individuals on their websites or releases. No single person and or individual Schaumburg-Lippe has himselfs or herself or groupwise the power or authority to rate the other line or its members which is often missunderstood, because of fabricated misleading statements to fool the foreign media: The German Government and Law Court and its rulings are the only valid state power, granting acceptance, issuing title and name of prince and princess. 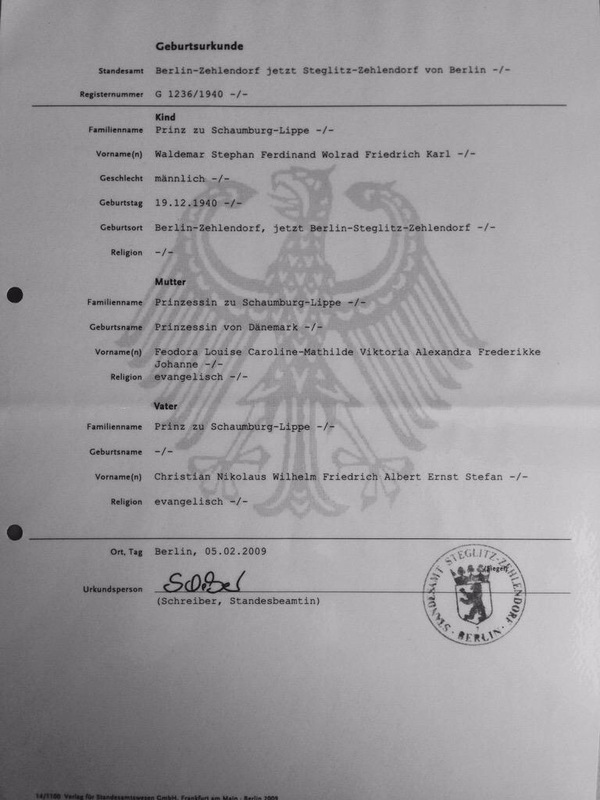 The German government authorized His Highness The Prince Waldemar, Her Highness The Princess Antonia and His Highness The Prince Mario-Max zu Schaumburg-Lippe with their rights and Princely names and status. The german mass media reflects on that by ongoing correct reportage and interviews of the respected Royal Line of Schaumburg-Lippe which can be easily proven be looking into google about the individuals of the Royal Line zu Schaumburg-Lippe Nachod Branch. False Information spammed on facebook, blog websites of individuals, and self proclaimed royal blogs (self proclaimed gossip experts), spam comments in news sites and alikes, repeatedly (and even paid for the manipulaton of the public) have been detected by the Princely House Schaumburg-Lippe of Royal descent. The publication of invalid information is a crime, and you might have followed previous problems with wikipedia, blogs and other websites regarding their abuse for spreading mallicious content. Regelmässig wird auf Wikipedia von offenbar persönlich oder anscheinend sogar finanziell motivierten Autoren eine Herabwürdigung von Namensträgern der fürstlichen Familie zu Schaumburg-Lippe aus dem Hause der Sekundogenitur Nachod betrieben (Waldemar, Antonia, Mario-Max Prinz zu Schaumburg-Lippe). Dabei werden als Quellen zum Rufmord Boulevardgeschichten verbreitet anstatt seriöser Quellen und eine Vorrangstellung anderen, bedfreundeten, Namensträgern zugebilligt, die selbe oder ähnliche Namen und Künstlernamen führen, obwohl für alle beteiligten deutschen Bürger die derzeit gültige Verfassung nicht historische Fantasien oder Vorbilder maßgeblich sind.